Children of East France have an evil visitor to keep them behaving all year long. Le Pere Fouettard, which translates into “The Whipping Father,” accompanies Saint Nicolas in on December 6. While St. Nick gives good children presents, Le Pere Fouettard gives coal and whippings to the naughty children. One of the most popular origin stories of the character say that he was a greedy inn keeper who killed three rich boys on their way to boarding school. In many versions of the story, he even eats the children. Whether or not he cannibalizes the boys, the story ends when Saint Nick finds out and resurrects the children and forces Le Pere Fouettard to act as his servant throughout time. 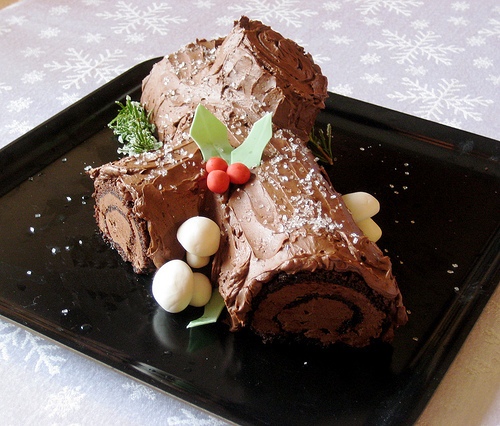 Aside from The Whipping Father, another popular French tradition involves making a cake that looks like a traditional Yule log, known as buche de Noel. Christmas trees never really caught on in the country and while most people don’t have any use for an actual Yule log, the cake is a fun and festive substitute. Some of the buche de Nol can get fairly elaborate and even involve meringue mushrooms and edible flower decorations.